At the premiere of Elgar's Cello Concerto in 1919, John Barbirolli - himself a cellist - was playing in the London Symphony Orchestra. When he recorded the work in 1965 he chose Jacqueline du Pré as soloist and she remains inextricably linked with this elegiac, but passionate work. 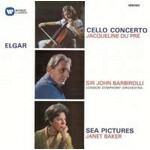 Barbirolli's special affection for Elgar's music is just as evident in the glorious account of Sea Pictures with Janet Baker and the Philharmonia Orchestra.